Celebrating their newly opened location in Boca Raton, Robb & Stucky's Coral Gables Showroom joins Thom Filicia and Vanguard Furniture for an evening of drinks, hors d’oeuvres, and insightful dialogue. 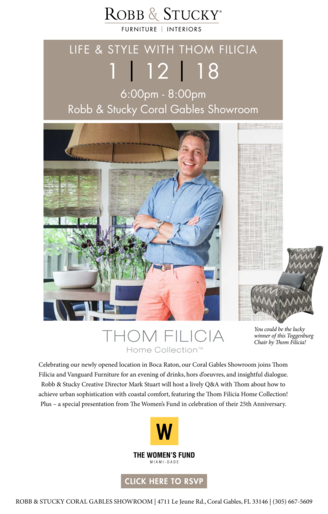 Robb & Stucky Creative Director Mark Stuart will host a lively Q&A with Thom about how to achieve urban sophistication with coastal comfort, featuring the Thom Filicia Home Collection! Plus – a special presentation from The Women’s Fund in celebration of their 25th Anniversary.